This is the second and last portion of our Pampanga Day Trip. To see the first serving, kindly click here. After that, we decided to drop by Guagua church as well, since we’re already in the area. Characterized by its huge white dome, the Guagua church appeared to me as more beautiful outside than inside. The sad thing is that the entrance to the church is hardly prominent, and various structures surround it and you cannot fully appreciate its grandeur. While we were in the town of Guagua, we surely didn’t miss Razon’s halo-halo. This Filipino snack, usually made of more than a dozen ingredients, was made special by the Razons by only using three – leche flan, macapuno, and minatamis na saging (sweetened bananas). I’ve tried it in Manila, but it was crappy. In Pampanga, it was actually very, very good. The ingredients were generous and I was impressed with the milkiness of the snack (versus the watery taste as they serve in the malls). It was indeed a special snack…and I wish they can replicate the flavor in their branches in Manila. Our last stop for a church was in Bacolor, where a third or half of the church structure was buried under the ashes when Mt. Pinatubo erupted in the early 90’s. This was the church where the series May Bukas Pa was filmed. I didn’t dare go inside as there were no lights, and my friend Mimie was spooked when she tried entering. At the back of the church was where a cemetery once stood. Now, a list of names of the dead buried here is all that reminds us of them. No more tombs, except for the multilevel ones. Finally, we headed to San Fernando City in anticipation of the Giant Lantern Festival. 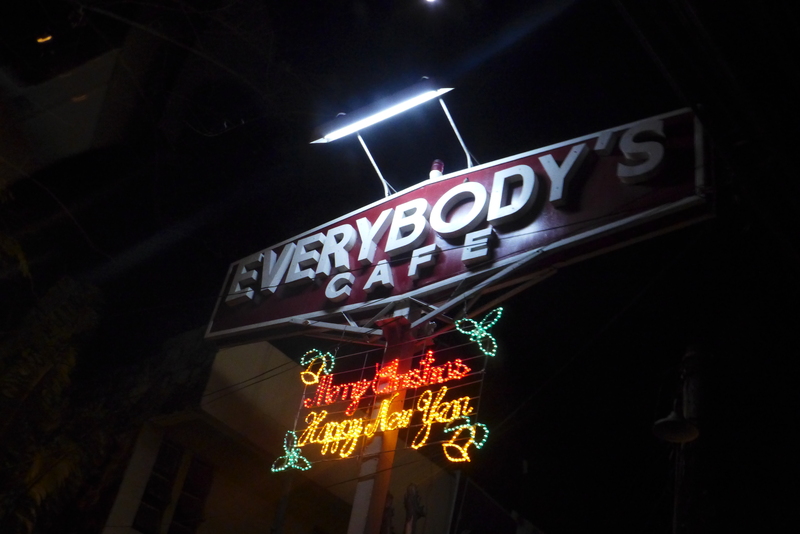 Before proceeding to the festival grounds, we went to have dinner in none other than Everbody’s Cafe. Here, we tried their stuffed frog, buro (fermented rice), ensaladang pako (fern salad) and camaro (crickets). Next thing we knew, we were already at the grounds of the annual Ligligan Parul. This ended our food and cultural trip in Pampanga. I thought it was already a very long day, until we reached the bus terminal in San Fernando. There were no buses, and the one that arrived after 15 minutes was already full! We either had to wait for the next bus, which would arrive on the next hour, or we had to stand inside the bus on our way to Manila. We chose the latter since we all wanted to get home already. Upon reaching my destined stop, just as I was dialing my brother’s number, my cellphone was snatched. Talk about travel misfortunes! It was an unfortunate way to end an otherwise beautiful day. Oh well, I’m charging that to experience. Anyway, it’s about time for me to change my cheap phone. Haha!